The death toll from Saturday's devastating earthquake in Ecuador has risen to 570 and could increase by many more, authorities in the country say. Figures given by officials for the number of people missing ranged from 231 to 1,700. Thousands of people have been left homeless, making them vulnerable to dirty drinking water and disease. Meanwhile a new 6.2 magnitude quake struck off the Ecuadorean coast, the Pacific Tsunami Warning Center said. The quake was centred 70km (44 miles) west of Esmeraldas at a shallow depth of 10km. The World Food Programme and Oxfam are sending supplies, while the UN said it was preparing a "major airlift". Deputy Interior Minister Diego Fuentes said 2,000 people had been reported missing since the quake struck. He said that 300 had been located since. Ecuador's Defence Minister Ricardo Patino later said that 231 people were still missing. The cost of rebuilding could be up to $3bn (£2.1bn), President Rafael Correa said during a visit to the worst-affected region. Sniffer dogs and mechanical diggers were being used to search for survivors in areas and the smell of rotting bodies was filling the air, witnesses said. Some people have been pulled out of the rubble alive but, despite the efforts of emergency teams, hope is fading that others will be found. From Tuesday, rescue efforts would become more of a hunt for corpses, Ecuador's Interior Minister Jose Serrano told Reuters. Focus is turning to the survivors. 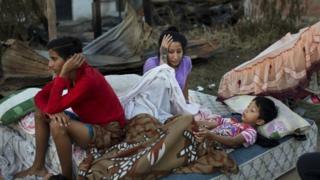 The quake damaged communications, transport links and sanitation, hampering relief efforts. Unicef has warned that 150,000 children have been affected by the disaster and said landslides were complicating rescue efforts in some areas, and some towns were without electricity. The Spanish Red Cross estimated that up to 100,000 people would need assistance. Reconstruction costs are likely to be huge at a time when the oil-producing country is already reeling from the slump in global crude prices. Funerals for some of those killed have been held in Portoviejo and Pedernales, two towns that were the worst hit.